Day jobs and running a (however small) mothership are time consuming, aren’t they? How anyone has time for updating the world on their slowly developing painty plans is beyond me. Excuses out of the way, let’s get down to the real news, a round up of all that has been and will soon be happening in the world Art by Imi. Back in December, I entered my kookaburra, Herman, into this prestigious competition – which sees the shortlisted paintings hanging at the Mall Galleries in London… right now. This week! GO SEE IT! I just missed out on being hung, but a copy of my painting is being displayed in a folder at the exhibition (Selected not hung), and is also up for sale on their website. It gives me lots of confidence that maybe next time, I might just get hung! A rainy affair to say the least. 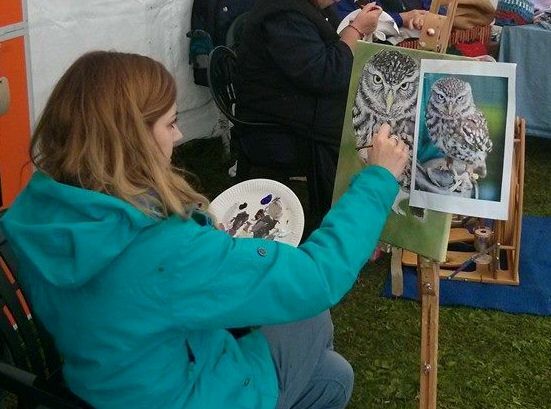 Wrapped up in my ski jacket in late May, I spent the day painting Tomtom, an owl with a hella lot of attitude for someone only 20cm tall. We met Tomtom (original name forgotten) at a Country Fair in Norwich, and I fell for him. Snuggling into the shoulder of his adoptive mother, he glared at us as we angled a camera in his direction, and we took some moody yet adorable photographs. 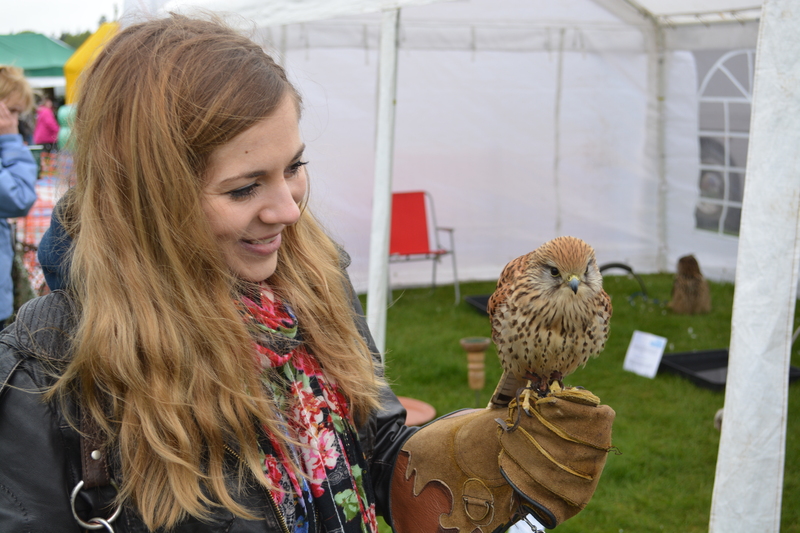 I got to hold a hawk, and we stumbled across concepts that I didn’t even know existed… like the Norfolk Goat Club. But anyway, back to Rowledge Village Fayre. Despite the weather, Rowledge residents were out in force, and I got snapped painting by photographers from the Farnham Herald and the Ash & Farnham News and Mail. I met many dogs, and may have lined up some commissions for the coming months. 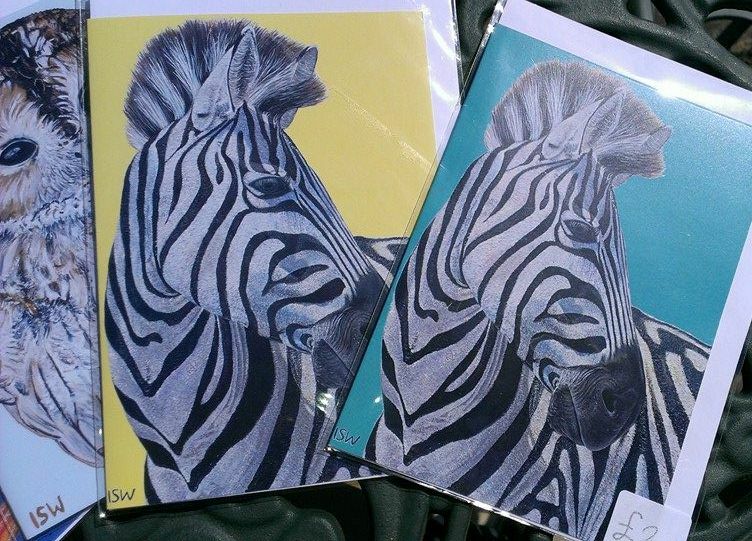 My new selection of cards also proved popular – please contact me if you want a pack. At the fayre, I met a mother of a nine year old girl, who asked me if I would consider art tutoring to me. When I was nine, I started having flute lessons. Breaking away from the norm, she will have ‘how to paint a bunny’ lessons. After pinging a few emails back and forth, it is planned that I will teach my young apprentice in a series of six private lessons beginning in August. Having never been taught in animal portraiture myself, I think it will get me to ask myself why I do things how I do them, and consider ways of improving my own methods. It will also (hopefully) get my apprentice enthusiastic about art, and enable me to influence her from a young age to ALWAYS PAINT THE SIDES OF THE CANVAS! It is an exciting new project for me, and I hope it will open up doors to further teaching opportunities. Ah yes. Painting. I have been doing some of that too. Not as much as I would like, but some. Problem is, as soon as I get it out, the whole house looks like a bomb has hit it. I am currently painting a kingfisher (yes, another one). I am really enjoying it, it’s a fun project! Mixes of turquoise, phthalo green, and purple to create those distinctive teal feathers, and flashes of orange and gold for the glinting chest. 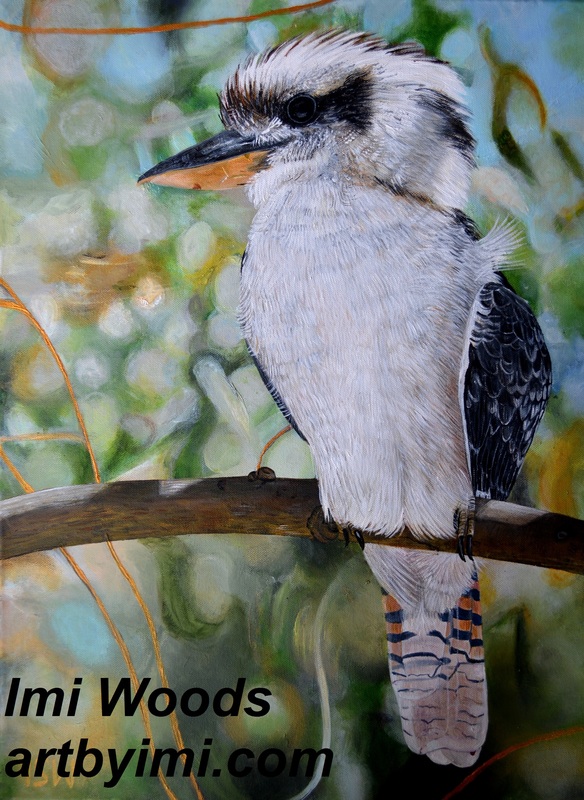 My new kingfisher is being painted for display in the Marwell International Wildlife Art Society (MIWAS) Annual Exhibition this year. It’s at Rookesbury Manor in Wickham (which is half way between Portsmouth and Southampton) from the 29th – 31st August. I am giddy with excitement about it, and about the opportunity to be up there hanging with the big dogs of the wildlife art world (the pun was too good not to throw it in). On Saturday 30th August, I will have a stall at the adjoining art market, where I will be demonstrating my art and selling my work, while on Sunday 31st, I will be acting as a guide at the event, greeting visitors and showing them round the exhibition. For the amazing calibre of art you will see, I urge you to put the date in your diary and visit this exhibition. I was awestruck last year at the detail and beauty of the work, and how down to earth the artists were. This entry was posted in Art stalls, Exhibitions, Lifestyle, Painting for pleasure and tagged acrylic painting, animal artist, animal artist norfolk, animal artist surrey, animal commission, animal painter surrey, art, art stall, art teacher cambridge, art teacher downham market, art tutor ely, art tutor norfolk, country, life, marwell exhibition, marwell zoo, MIWAS, MIWAS 2014, painting, pet painting farnham, pet portrait downham market, wildlife art surrey by Animal Art by Imi. Bookmark the permalink. So lovely to hear this update. It sounds like things are going well for you. I hope you get a lot of value from teaching. Whenever i teach creative writing, I often feel like I learn more than my students. I have to review the elements of writing and break down the major concepts. It really helps me in my own writing projects. Good luck at the August exhibition!